California queen mattress pad size 60 in. x 84 in. 95% of our orders ship with 5 business days. Please allow standard ground transit time depending on your location. The top of the mattress pad is cotton for comfort, and the fill is 100% polyester for some cushioning. 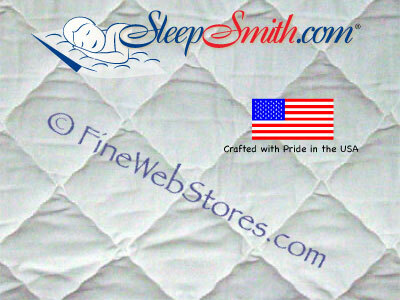 There is stretchy material along the entire perimeter of this mattress pad including the pockets for a sure fit. This pad lays directly on the top of the mattress for protection. This mattress pad is not waterproof. Fits mattresses 7-15 inches thick. This mattress pad is cold water machine washable with a cool tumble dry, no bleach.